Monday did not catch me by surprise today! Let me get a cup of coffee and I will be back to write. OK, coffee in hand (well, on desk at the moment) and hopefully I am awake enough to not write anything too drastic so that my family will not speak to me or own me. Believe me, it has happened before, like here. 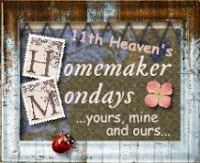 I do not know about you, but some parts of homemaking are hard for me. I am more laid back, messes do not bother me till they get bad and I am not always running behind my granddaughter (or even myself for that matter) to make sure everything is picked up the minute it is done being used. Scout, my granddaughter, rips paper, gets toys out, gets out my plastic containers and I get to them eventually, but not immediatly. I am an all or nothing person. Either I am wacked out over making sure everything it spotless, or else I am so laid back it piles up. Finding a middle road is hard for me. Having five kids at home I found it almost impossible! I am a grandmother now, no kids at home but one I babysit all day. I want to do my sewing and she wants to do her playing. As a result, my husband can come home to pieces of scrap fabric all over the floor with the toys and Scout’s ripped up “mail”. Dishes from lunch in the sink (we do have a dishwasher, but…) . Poor guy, works all day and this is what he comes home to. I have been working all day too, and that is part of the mess. My husband is very supportive, I like to brag about that, but I also like him to come home to some semblance of order. I cut out on the chest freezer and try to throw away any papers, scraps etc right away where Scout can’t find them. If she likes the fabric, even pieces 1/4″ wide are carried off. Keep her books in one place and read to her in the chair by that place, she then keeps them near there too. Have her high chair available in the Living room to put her drink, crayons etc on and she can get them and return them as she needs. Dishes: we will not talk about that! I need to get more organized with all this as I am working on a home sewing business and plan on opening an etsy store in the near future. Sewing has to be out, but I can keep it neat and organized. Any tips you have are more than welcome to comment on. I can use it! I Learned it, But I Do Not Want To Do It! Oh…it’s so hard for me to stay organized……a constant battle. We’re all in this together. organization is over-rated huh??? I thinks it great to kick back and stay relaxed….once in a while we can get wigged out and go on a crazy clean-up run. I too, live left or right, and have to work on the middle of the road! I see working on it as progression:). Thank you for your honesty, and MORE POWER TO YA! I I try to get organized it works for a day then back to mess as usual. Glad you found some thin that works for you. We didn’t stop speaking to you over THAT post. It just took some of us some time to scrub the mental pictures it caused from our memory. Anyway, I would love to be more orginized but with two sons and a husband following behind me undoing all my work, I’ve kind of given up for now. But one day I WILL have the house the way I like it.